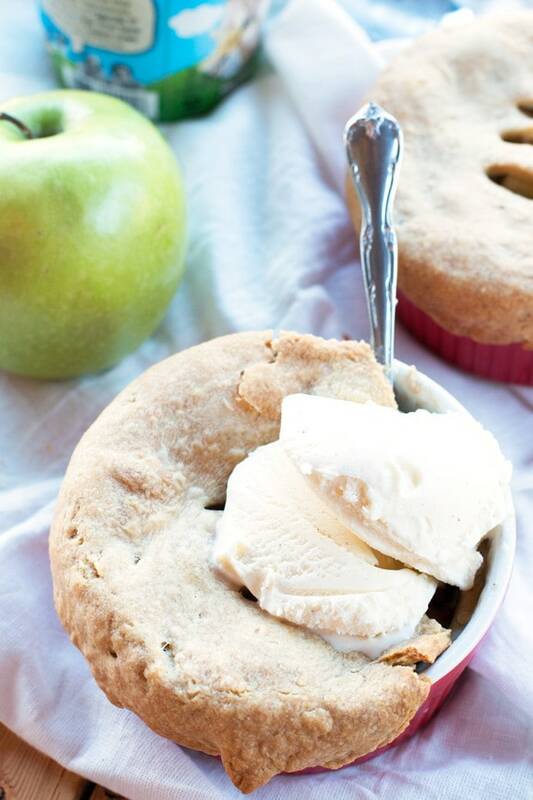 Easy Individual Bourbon Apple Pies are the perfect sized dessert to fulfill a fall dessert craving or to serve at your next holiday party. All the flavor of apple pie, a quarter of the effort and spiked for your merriment! 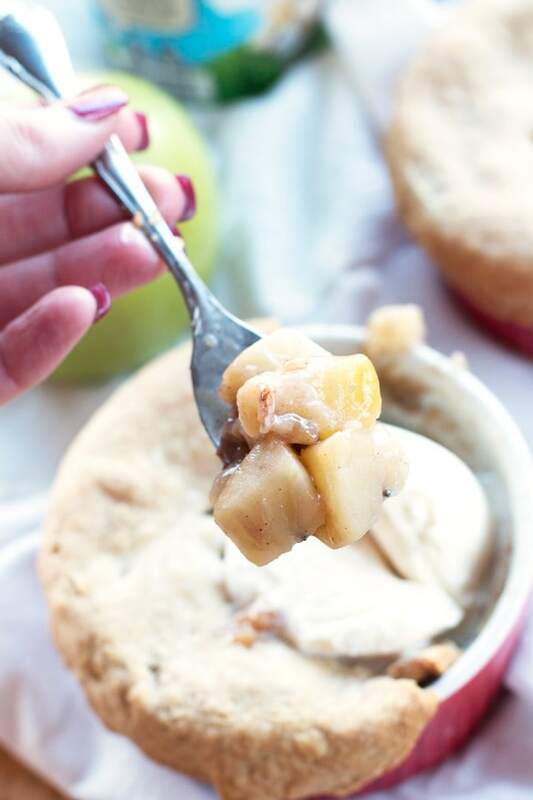 These little easy individual bourbon apple pies were born out of a combination of craving apple pie, not being able to readily access a food processor and pure laziness. The best ideas are born from a combination of cravings, limitations and laziness, right? I say YES. 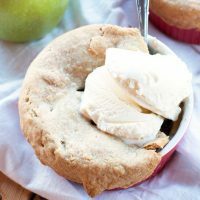 I went back and forth all week about whether I wanted to make a traditional apple pie, an apple tart, or just throw my hands up and hide from the disastrous baking luck I’ve had lately. It’s been a rough week in my kitchen folks. When I finally decided I was making something apple pie-like, the idea popped in my head to make them individual pies. I’d love to say it was an effort to keep my diet in check, but really it was an effort not to share with anyone else. If you aren’t feeling the baking but want all the warm goodness of a slice of apple pie, this is your new bestie. 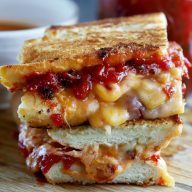 I even threw in some bourbon to make that warm feeling in your belly last a little longer with every bite. Dessert cravings, girls night in, holiday parties, Thanksgiving dessert, a special dessert for two (which will surely get you some lovin’, just saying…) – there’s no occasion that isn’t right for these little pies. 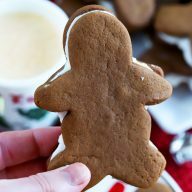 They take barely any effort to pull together, the majority of the time is spent baking in the oven so you can sit back, relax, and start prepping your palette with a little bourbon and vanilla ice cream. What, that isn’t your typical Thursday night? Pin this Easy Individual Bourbon Apple Pies recipe for later! All the flavor on an apple pie, wrapped up in an individual ramekin just for you! Lightly roll out pie crust into a large rectangle. If the dough is dry you can add a little water and work the dough until it's malleable enough to roll into a large rectangle. Cut circles that are 1/2” wider around the edge than the mouths of the ramekins you plan to use. Set dough aside for the moment. In a large skillet, combine chopped apples, lemon juice, flour, 1 Tbsp unsalted butter, brown sugar, granulated sugar, cinnamon, nutmeg, bourbon and salt. Cook the apples over medium heat until they are just turning soft but are not falling apart, approximately 10-12 minutes. Fill the ramekins with the apple mixture, dividing evenly between them. Butter the edges and rims of the ramekins. Add 1/2 Tbsp to the top of the apple mixture in both ramekins (if you’re using 4 small ones, add 1/4 Tbsp to each ramekin filling). Add a circle of pie crust to the top of each ramekin, letting the crust drape over the edges and pressing down firmly on the edges all the way around. Bake for 20 minutes until the crust is golden brown and cooked through. Serve immediately with vanilla ice cream. So you used a ready made crust that you then rolled out further? I didn’t know that was possible! I’m planning to do mini pies for our wedding treat table (among like a million other things), so that would be a time saver that would also guarantee no frustrating baking flops (def won’t be able to deal!). 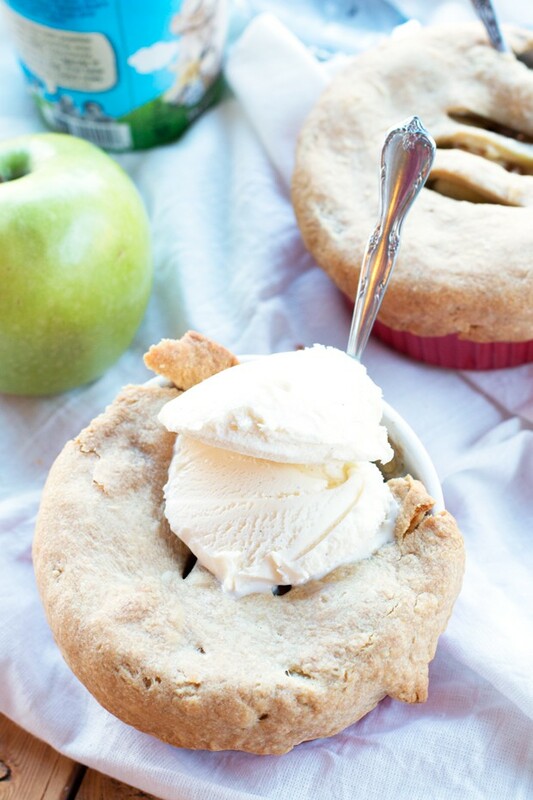 I love mini pies and bourbon + apple sounds amazing! Yes, rolling it out into a large rectangle is what I meant! I reworded it so it makes sense now, LOL. It can be a pain if the dough is dry, like when they come in the pie pans, but it totally works if you add just a bit of water to make it pliable again. Ooooh mini pies are such a cute idea!! These are SO easy, they’ll save you a ton of time. You can even do a lattice top if you want to get fancy!